To the curmudgeon who pontificated loudly, even during the show, that it wasn’t working. I don’t know you, even though we have been engaged in the closeness of watching theatre together. So I can’t take you for a drink to let you know that you are just plain wrong and need to take your elitist, out of touch, resistant attitude and just sod off. Me, and I could hear and see, the other 150 plus audience just loved THE HOLLOW CROWN, first in the two part ROSE RIOT season from Sport for Jove. 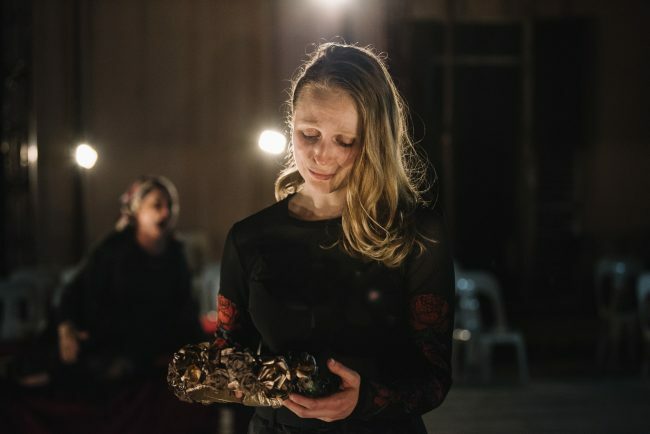 Playing at Bella Vista Farm, ROSE RIOT is two golden productions which are forged with vision, experience and coherent expression by a company who make bold choices, assemble extraordinary talent and encircle their audiences with enthralling beauty. There’s a reason why Shakespeare lends his name to an adjective. Reverence and relevance and the adventure of seeing the darknesses of great wrongs and the shiningness of majestic rights, all before our eyes with real voices, the musicality of poetry and a physicality that delights and engages. And ideas, always the ideas. In THE HOLLOW CROWN we are taken from Richard II to Henry V as the action unfolds in two locations on the site. Seated away from the worst of the heat in a breezy shed on a hill, the History begins as the cast assembles. They just keep coming … this is a huge ensemble with the most astonishing depth and utilised by Director Damien Ryan with a grand precision. In the daylight hours, before the twilight when lighting can effectively focus attention, Ryan choreographs his cast in both stasis and full noised action to foreground the deeds of the narrative. And allows the rose characters to rise. The performances are wonderful and each character in their turn beguiles and repels. Gender blind casting gives us a Princess Hal (Eloise Winestock in a bravura performance) who is dissolute, adolescent, energetic and impetuous then fierce in redemption. Her mother, Queen Henry IV, is a no-nonsense steely Bolingbroke from a power suited Emma Palmer. Falstaff (Bron Lim) is earthy and female in a comic style which explores carnality yet pays attention to love and loyalty. 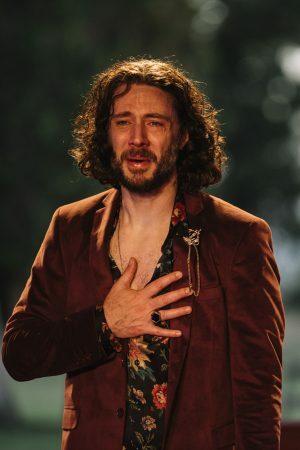 Richard II (Tim Walter) is surfaced as effete and overwrought in places with an intensity of seethe, yet with an empathetic draw on the audience as his hold on power crumbles. And it’s not just the lead roles that make this such a mesmerising production. 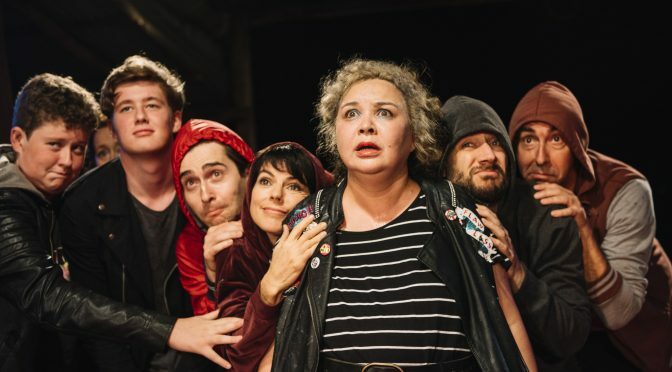 Chantelle Jamieson imbues her ‘silent queen’ with discrete supernaturalism and the hoodie and trackie rabble of the tavern burst and rave with infectious fun. 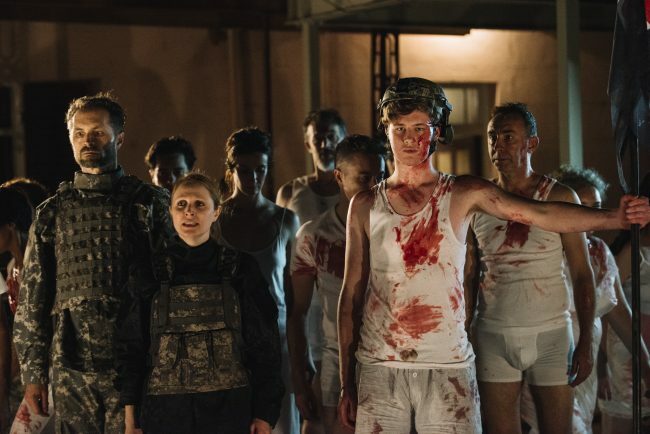 After the interval move, the superlative military exactness in the entrances and massing on the shed stage gives way to thrilling battles in the open air of site two after darkness has descended. Edge dull but scarily pointed blades flash, terrifying and confronting, when wielded with intent and the heart-stopping violence of speed. The battles (Fight Director: Tim Dashwood) are conceptualised for maximum viscerality and the costume conceit to express the English and French soldiers of Henry V’s warring is brilliant. Allow me a moment here to fan-girl Anna Gardiner’s costumes. On a charge of gules, flowers bloom. They are everywhere, rich in fabrics or embroidered on, and the colour and excitement of the first half is delectable eye candy and oddly cooling in the heat. But once more, it is detail that so distinctly enriches our enjoyment of the work. Brooches and earrings and killer heels as Princess Hal suits up like her mum. “Doesn’t work”? Tell that to my goosebumps as an unamplified voice, alone, echoing in open air, chillingly creates a muse of fire. His adaptation respectful to text and to audience, Ryan delicately balances mood and story such that the momentum of THE HOLLOW CROWN never flags. There’s laughs galore in places unusual, the outrageous character assassination of the French is hilarious! There’s discord and strife in relationships small and large. Intimate, marital troubles between Harry Percy and Kate hit home, and geopolitical royal choices that control the lives of we commoners worry at a modern sensibility as the production comes to a rousing conclusion. Sated by the picnic we brought and production before us wrought, we happy few are replete with villains and lovers and ideas unobtrusively illuminated. THE HOLLOW CROWN is magnificent entertainment of scale and thrill with a carry beyond its hours. Roll on THE WARS OF THE ROSES tomorrow night. ROSE RIOT from Sport for Jove (Facebook) continues at Bella Vista Farm until 30th December and the Leura Gardens Season from January 12. I don’t know what production that person was watching,I was there last night and tonight,both for the second time,I loved every minute of it.We have been going to this company’s shows for 10 years.We have never been disappointed.